To ensure the guarantee and compliance with safety standards, your TRUBLUE, QUICKJUMP or ZIPSTOP device must be subject to mandatory annual maintenance. During this control operation the unit will be opened, the inside will be cleaned, the parts will be inspected, lubricated and changed if necessary. Likewise, all technical updates will be done. The HRT strap and carabiner will be checked as well as the OPA and Ripcord depending on the model of the device. Then each device is tested to check that it works according to the standards given by the manufacturer. If you have a schedule to respect, we can meet it. Our HeadRush service technicians will do their best to control, recertify and re-ship the unit within the agreed time. Please contact us prior to sending your device. Advance notice will speed up the process considerably. You organize the shipment to the maintenance center, we will send the device back to you. To avoid transport damage, your device must always travel in a Headrush Technologies packaging designed for transportation. 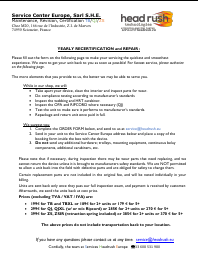 You will find below the order form to download as well as instructions for sending. Thank you fill it with all the useful information and include a copy with your shipment. Make sure the return address is correct. You can also send us a copy by email at service@quickjump.eu. Our entire team remains at your disposal to give the best service to your Headrush Technologies device.